My day started at 5 am today, with very loud, tinny, tuneless music playing somewhere nearby. As it was still going on two hours later, I asked the staff at breakfast what it was. They told me that for any type of special ceremony such as a wedding or a funeral the music is played for about three days. This prompted two thoughts. Firstly, who on earth needs three days to get ready for a wedding? And secondly – it’s rather tough on the rest of us who haven’t been invited – couldn’t the guests just listen to it on headphones? Anyway, I arrived at school only to find the same loud music blaring out there too. A complete coincidence and a totally different ceremony – Fridays must be a popular day for ceremonies. The school director told me that the people organising the ceremony turn the speakers away in the opposite direction so they don’t hear the music … very sensible, I thought. But on the plus side, I was very cheered to discover that, as a games teacher, I would not be compelled to wear a very short skirt designed to show off my muscular thighs and then stride about wielding a hockey stick menacingly. 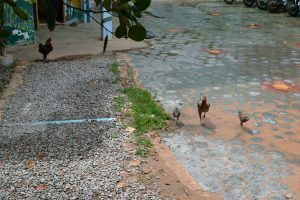 In Cambodia, games lessons include board games and jigaw puzzles, and since the field is rather soggy in the rainy season, more sedate types of game are preferred. That suited me fine and we played bingo, hangman and did jigsaws with my morning group. The afternoon class descended into the usual chaos, made worse by the constant music, so everyone had to raise their voices to be heard. They didn’t want to play bingo, they wanted to play football, so half of them disappeared from the classroom and the other half scribbled aimessly on their whiteboards while a few random chickens pecked around outside. The music also created havoc during the English listening test. 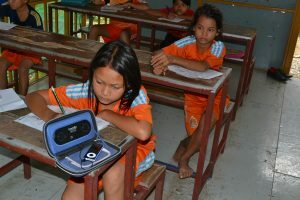 The sound system is tiny and not very loud; every child has to have it on their desk to hear it, so the test had to be played umpteen times as the machine moved around the room. In the end I offered to read the transcript of the test aloud – gamely playing both roles myself, leaping from side to side as I changed character. I don’t really think the children found my rendition any easier to understand, but it was far more entertaining.